What do you need to enjoy Peter Pan Return to Never Land on Blu-ray? "All you need is a little faith, trust, and pixie dust." The general rule when it comes to blockbuster animated movies is the sequels are not as good. Peter Pan Return to Never Land explores some interesting concepts. Kids are growing up too fast thanks to the war. Some have even forgotten what it is like to be a kid. Instead they are practical, and working on survival. They have no interest in playing, or having fun. This is where we meet Jane - Wendy's daughter. Wendy has grown up, gotten married, and had two kids of their own. Peter Pan Return to Never Land contains some comic mischief, and mild peril. Captain Hook has finally gotten rid of that crocodile. A giant octopus is his new animal nemesis. The captain, and his crew are trying to get their stolen treasure back. Initially Jane only wants to get home. She is on the island all by herself. She misses her mother and brother. She makes a deal with Hook, and befriends the Lost Boys to get what she wants. She learns how to be a kid again though. She learns how to have fun playing. This is the point where she realizes what is really important to her. 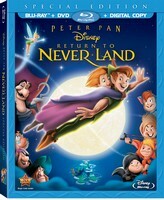 Family Friendly Gaming was provided the Blu-ray + DVD + Digital copy version of Peter Pan Return to Never Land. That means multiple ways to enjoy this 72 minute movie. There are also deleted scenes, a music video, and humorous Pixie Previews. Some of the best parts of Peter Pan Return to Never Land are when Peter Pan is dealing with things he normally does not interact with. Like when he realizes Jane is Wendy's daughter. Aspects of his reactions are priceless in my opinion. I enjoyed watching this movie. If you like the first one you will appreciate Peter Pan Return to Never Land.